Umbridge is evil. Anyone who has read the books, seen the movies, or come within touching distance of a Potterhead knows this. Despite this community hatred for Umbridge, I’ve often questioned exactly what makes her so awful. Yes, she’s mean and doesn’t like our lord and saviour McGonagall, but neither does Snape and people still apologise for his actions for some reason. So why is she so, so much worse? Voldemort is the undisputed villain of Harry Potter, with Rowling making him the cause behind any problem Harry faces (Snape, plumbing, etc). However, this makes him such a normal villain. His character, minus the nose (ah?) is a carbon copy of every villain ever. He has an obsession with power, the protagonist, and has a devoted right hand man (or left, in Pettigrew’s case). He’s practically Megamind. No matter how scary and violent he is, he’s so familiar in a distant sense- we know that he’s just a villain and will be defeated, and that is comforting to us. However, Umbridge snuck out of nowhere. She starts off innocent and sweet yet the way she acts is subtly wrong. Not explicitly, like Voldemort, but implicitly. She turns into a villain though what we see of the way she treats students, which gets progressively worse. This is an evil everybody understands; everybody has had a teacher or mentor who is a little too mean or liberal with punishment. At minimum, someone we know has experienced similar abuses. Very few people have met Hitler or Stalin or Hussein, so we see them as bad but it’s not personal unless something has directly tied us to them. 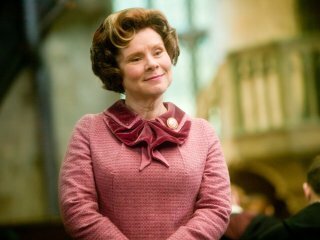 However, everybody knows someone like Umbridge and seeing her thrive in the setting she’s in (she has support from authority, which makes her worse) is infuriating. When she’s put in her place by McGonagall, it’s just so satisfying because the whole situation is representative of a struggle between good and evil, and since, by that point, we’ve all been well acquainted with McGonagall, so when who we want to win triumphs over the obviously evil Umbridge, we get our first taste of real victory in the series. Even though she pops up every once and awhile, and is more prejudiced and horrible every time, the initial smackdown is just so nice. Voldemort’s death is as flat as a saltine and was anticipated- he obviously had to die, the book was set up as a heroic journey from the start and an important part of this variation of that plotline is the death of the villain. Once again, he was familiar. Even though I hated him, he was such a distant character that only really arrived when Umbridge did, and she was more of an evil than he was during the fifth book. Once she’s out and he begins to recruit, he becomes the main villain. But, when she’s the primary villain and we see her abuses from the perspective of someone being directly abused by her, she just becomes so much more evil than him because she’s so present.